Miami Floral Company at Warner family home. When the Warner family arrived in Miami in 1906, the city’s population was a little more than two thousand people. Over the next five decades, the city earned its nickname by expanding so fast that its growth could only be explained as a magical illusion. Miami was one of the fastest growing cities in America in three of the first five decades of the twentieth century. While the Warner family may not have expected such rapid growth, they did see what a lot of other early pioneers saw in the Magic City. Miami presented tremendous opportunity to anyone with passion and perseverance. The Warner’s passion was flowers. The family persevered for sixty-six years in the floral business. 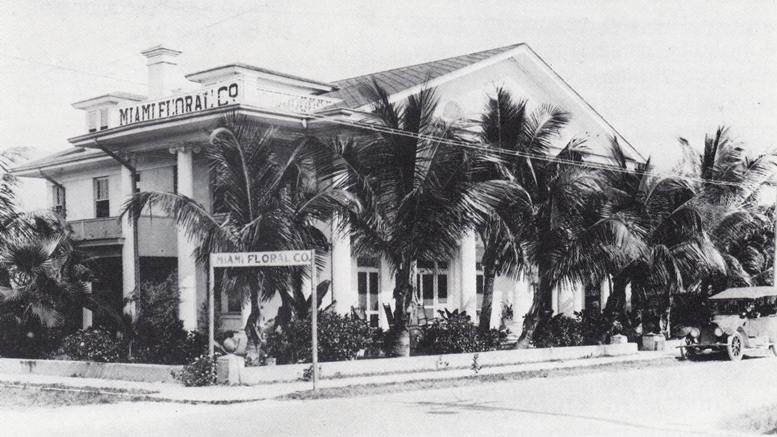 Although the Miami Floral Company closed in 1972, the location of the business, which was also served as the family’s home, still stands to remind us of the pioneer spirit that helped build early Miami. Figure 1: Ad for J.W. Warner for City Clerk in 1911 in the Miami News. Like so many other Miami pioneers, James Warner came to Miami employed by Henry Flagler. He was born in Marietta, Georgia on February 3, 1871 and was educated in the Atlanta area. After graduating from business college, he got married to Susan Clarke and began a family. He also began a promising career as an accountant for the Florida East Coast Railway in Saint Augustine, Florida. When James moved his family to West Palm Beach, he acquired land that was located just west of Riviera, Florida. He planted on orange grove on his land and maintained it long after leaving West Palm Beach for Miami. The Warners moved to Miami when James was hired to help in the accounting department for Flagler’s Oversea Railroad project. Shortly after moving to Miami, Susan wondered why there were no florists in their new city. She felt that if a floral shop could work in West Palm Beach, why couldn’t it work in Miami? She began to grow flowers a couple blocks south of the Miami River near today’s SW Fifth Avenue. Susan created floral arrangements for friends and neighbors as a hobby, but got enough good feedback that she decided that her hobby could become a profitable business. The Warners started the Miami Floral Company in 1906. The company was the first florist in the area. Susan had to educate locals on the idea of buying flowers. Prior to the arrival of the Warners, Miami residents would grow and pick their own flowers. The employees of the Miami Floral Company demonstrated the value of presenting flowers in the form of an arrangement. In the early years of the business, the Warner family became personally acquainted with nearly every other family in town. The Miami Floral Company got a lot of business from guests staying at the Royal Palm Hotel, as well as, wealthy part-time residents who spent their winters in Miami. Susan experimented with different types of flowers to see which ones could grow in South Florida. James employment with the FEC Railway ended when he accepted a job with the Miami Electric and Light Company in 1909. As he started a new job, he kept very busy helping Susan run the family business as well. A little more than a year after changing jobs, the floral shop required the full-time attention of both James and Susan. There was enough income to support the family, so James left Miami Electric and went to work for the Miami Floral Company full-time. The same year when James quit his full-time job, Miami Floral had become the first florist south of Jacksonville to become a member of the Florist Telegraph Delivery (FTD), network in 1910. Membership in FTD helped the company prosper. James was also very active politics and civic organizations. He ran for City Clerk and Collector in 1911. His dedication to the Southside Civic Association was recognized when he was elected president of the organization in 1915. Warner believed community involvement was good for business and the family name. While James was transitioning from the electric company to the floral business, he was beginning to prepare for the construction of a more permanent home for both his family and business. Warner purchased two large lots south of the Miami River on Avenue J. His plan was to build a grand southern colonial-style home like the mansions he admired while growing up in Georgia. Figure 2: Warner family in front of recently completed home in 1912. James hired German-born architect George L. Pfeiffer to design their home in southern neoclassical style. He was a very prominent architect in early Miami. He was also instrumental in establishing the Florida Chapter of the American Institute of Architects. The Warners experienced the 1906 hurricane and decided that the home should be built with reinforced concrete to protect the family from future storms. Most homes were built with wood during the early years in Miami. The columns were made of poured concrete. Workers used mules to pull buckets of concrete to the top of the wooden laths to complete each column. The home featured six three-story Ionic columns along the front of the home. Because the Warners had a big family and liked to entertain out of town guests, the home consisted of three stories and twenty-two bedrooms. Each of their six children had a spacious bedroom of their own. The residence included electricity and indoor plumbing, which were not common in Miami when the home was completed in 1912. Elmina, the Warner’s oldest daughter, recalled that they had to cut down pine trees to run a powerline from Flagler Street to their home to get electricity. While the Warners enjoyed the luxury of having two indoor bathrooms, most of their neighbors relied on outhouses. The home was built on an elevation and was reinforced with sixteen-inch thick walls, so it was prepared for flooding and other weather events commonly experienced in Miami. The two lots were 100 by 150 feet in size. There was enough room to accommodate the home and a couple of green houses to the east of the residence. Part of the spacious downstairs was used as the floral shop. Clients would enter from the west side of the home to conduct their business. As the children got older, everyone worked in the floral shop. It became a multi-generation family operated business. At the completion of the home in 1912, the total construction cost was twenty-five thousand dollars. It was at a time when the most direct route for the Warners to get to downtown Miami was to cross the Avenue J bridge over the Miami River. The turn-style overpass was manually opened and closed by a bridge tender using a wooden-crank. The structure was built in 1906 by the Tatum Brothers and was originally a toll-bridge. It was a time when the Miami River was crystal clear and the Warners had an unobstructed view of the entire city from their third-floor perch. It was a much quieter and simpler time. Figure 3: Flanders property that became Magnolia Park in 1915. While his home was nearing completion, James Warner was hired by Walter E. Flanders to supervise a team of fifteen to twenty-five men to landscape and beautify the grounds of his home in Buena Vista. It was a big and important job for James considering the notoriety of the man who hired him. Flanders made his fortune and reputation as an automobile magnate. He began his career as a machine tool salesman who built his reputation optimizing manufacturing operations. He was hired by the Ford Motor Company to improve their assembly-line process in 1906. When he left Ford in 1908, he founded two other companies that were eventually were acquired by much larger companies. By 1912, Walter Flanders was both wealthy and well known. Many years later, his accomplishments were honored when he was inducted into the Automobile Hall of Fame in 1994. Flanders and his wife purchased the Gratigny property in Buena Vista in 1912. The Miami News reported that Flanders would spare no expense in the development of his home and property. Warner dedicated his attention to supervising the Flanders project while also supervising the completion of his family home. The year 1912 was a very busy one for James and Susan. A few years later, Walter Flanders sub-divided his vast estate to create the Magnolia Park sub-division. The area was officially platted on March 22, 1916. Magnolia Park is bordered by NE Second Avenue and Biscayne Bay from west to east, and from the Julia Tuttle Causeway to Forty-First Street from south to north. 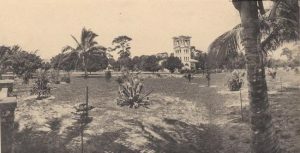 Following the completion of the Flanders project, Miami Floral signed a contract to beautify and maintain the grounds of the Halcyon Hotel in the spring of 1913. The contract also included the floral arrangements for the interior of the hotel. The company purchased the structure and refrigerators adjoining the hotel from which it sold cut flowers to hotel guests and visitors. James also did a lot of landscaping on Miami Beach in the mid-1910s. In an interview in 1978, his daughter Elmina said that “he got paid with lots on South Beach, but he traded the lots off later to buy out a member of his flower company”. George Warner added that those lots would have been “pure gold” had he hung onto them. Miami Floral was given great reviews for the work completed for the Flanders and at the Halcyon Hall Hotel. Business continued to grow as Miami headed into the roaring twenties. However, the early part of the decade was marred by a couple of terrible tragedies for the Warner family. Figure 4: Obituary headline of James W. Warner on March 7, 1922 in the Miami News. Early in 1922, the usually very energetic James Warner was forced to take time off from work and rest due to a lingering illness. After a few weeks, the family was given the news that the patriarch was diagnosed with an incurable malignant disease. On March 7, 1922, James passed away in his home at the young age of fifty-four. He was remembered as civic minded and a leader in the business community. He was survived by his wife and his six children. The loss of the head of the family put more responsibility on Susan and the Warner’s oldest children to run the floral shop. The family received more bad news a few months later when the youngest member of the Warner family died in November. Almond Madison Warner was only fifteen years old when he died in the family home from a sudden illness. Despite being grief stricken, Susan remained strong and kept the Warner children together to run the Miami Floral Company. The business continued to thrive under Susan’s leadership. She was the face of the company until her death in 1942 at the age of sixty-nine. At the time of their mother’s death, only two of the five children were still working in the family business. The others chose to pursue different careers. Figure 5: Autumn, George and Elmina Warner stand outside of family home in 1978. While James, George and Elizabeth decided not to work in the floral business, they did remain in Miami for most of their lives. James was the oldest son and he became a Miami city policeman while George worked for the City of Coral Gables. Both sons worked in their respective fields for thirty-five years before retiring. Elizabeth never found the floral business to be to her liking. She chose to follow in her mother’s footsteps and taught music. Susan Warner taught piano part-time when she had some free time. Elizabeth was the co-chairman of the National Guild of Piano Teachers and kept very active in civic organizations during her lifetime. She passed away in December of 1961. George and his wife Autumn lived in Coral Gables for six years before returning to the family home right after the 1926 hurricane. The home was spacious enough for several families to live comfortably in the home that their parents built in 1912. The two siblings that remained in the business after their parents died were William and Elmina. William’s wife also spent her career working for the Miami Floral Company. Irene was a designer for thirteen years before she and William got married in 1936. By 1972, the trio were in their seventies when the company celebrated its sixty-sixth year in business. William, Irene and Elmina had not experienced a holiday season free from long hours in the floral shop. In December of that year, they announced that the business would close for good. The Warners remembered Christmas being one of the busiest days of the year for the floral shop. They got the holiday off for the first time in their adult lives. Figure 6: Warner home in 1982 shortly after it was sold. Within ten years of shutting down the family business, William and George had passed away and Elmina had left Miami to retire in Burnsville, North Carolina. George’s widow, Autumn, was the last Warner living in the house. Rather than live along in such a big house, Autumn and her daughter put the home up for sale. In addition to the home being too large for Autumn to maintain, the area had also had become run down and dangerous. A task force for the Miami Police Department labeled this part of East Little Havana as “Little Vietnam”. By the early 1980s, there were several sting operations that raided drug dens in the neighborhood. Fortunately, there were a group of preservationists that were hell bent on saving the home. It had been a part of Miami’s history too long to be replaced with new development. Sally Jude, Dolly MacIntyre, Maggie Wood and Tim Blake formed a partnership called the Magic City Restoration Company. The partners raised and borrowed money to purchase the property from the Warner descendants for $160,000 in the Fall of 1981. The partnership leveraged tax incentives and went to work to restore the home. The group invested another $325,000 into the property to modernize the amenities, update the wiring, and repair immediate concerns. Once the project began, the first order of business was to rejuvenate the exterior. Decayed wood under the eaves and Porte Cochere were replaced. Screens, shutters and porch rails were rebuilt. The house was re-wired for electricity, and central air conditioning and heat were installed. While there was a lot of work to be done to modernize the historic home, the group was pleased with the condition of the well-built home. In a Miami Herald article in 1984, Tim Blake said “the walls and columns never cracked. They used the right sand, not beach sand.” Beach sand was used in the construction of a lot of early masonry buildings in Miami which ultimately compromised the integrity of the concrete mix and led to cracking of walls and foundations. In March of 1982, the Warner house was given a new zoning district to support the preservation effort. Once this new district was confirmed, historic buildings being renovated were given concessions and not held to all of the same standards as new construction. The work by the Magic City Restoration Company paid dividends beginning in the Spring of 1982. 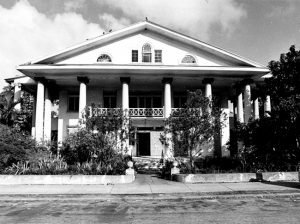 The Warner house was given historic designation by the City of Miami on April 22, 1982. A year later, the home was added to the National Register of Historic Places on April 28, 1983. However, the building needed to be economically viable in order for it to make sense to the investors. 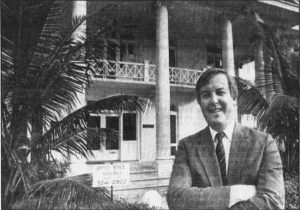 Figure 7: Tim Blake stands outside of newly restored Warner Place in 1986. Once the renovation was complete, the building was listed as commercial office space under the name of “Warner Place”. The management company marketed the space as conveniently located to downtown Miami and within walking distance to Government Center and the Court House. It also touted the building’s unique architecture and history. The most important selling point was that the rent was very affordable. Although the neighborhood was still considered dangerous, Warner Place did attract commercial tenants. One of the first to sign a lease was Metro Dade’s Historic Preservation Division. Within a few years, the building’s tenants included architectural firms, law offices, a real estate broker and the county archaeologist. There was optimism that the restoration of Warner Place would lead to improvements in the neighborhood. While it took time, the area has turned around considerably since the home was restored and designated. 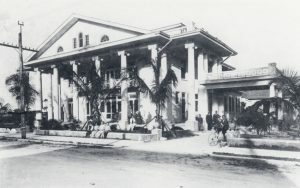 The building proved economically feasible enough for the partners to maintain it for more than two decades before selling it to the Miami Hispanic Ballet in 2009. The Miami Hispanic Ballet was founded in 1993 as a non-profit dedicated to identifying and supporting local dance talent of Hispanic-descent in Miami-Dade County. The organization originally leased space in the Warner House, but decided to purchase the building in 2009 when they received a grant of one million dollars from the Miami-Dade County Cultural Affairs Council. The purpose of the grant was to allow the non-profit to purchase a permanent home. In 2012, the Miami Hispanics Cultural Arts Center moved in, and the Miami Hispanic Ballet was given a second grant to remodel the building. Today, the Warner House is a landmark for culture as well as history. The residence is more than one hundred and five years old at the time of this article. This building is more than a historic home, it is a story of passion and perseverance. 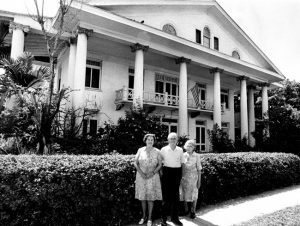 Thanks to the passion of the Warner family and four avid preservationists, the Warner house remains today as a symbol of the perseverance of a Miami pioneer family. Southern Florist and Nurseryman: “First Florist in South Florida, Miami Floral Company, Still Under Same Family Name”, July 16, 1965, by Porter V. Taylor. Preservation Today: “The Warner House”, (Summer 1983 / Volume 1 / Number 2) by Becky Roper Matkov. Book: “The Lure of the Southland” by C.H. Ward in 1915. Miami News: “Miami To Have Fine Floral Garden and Fern Nursuries”, December 22, 1910. Miami News: Expense No Item in Making Flanders Home Best in State”, August 15, 1912. Miami News: “Miami Floral Company To Beautify Grounds of the Halcyon Hotel”, May 13, 1913. Miami News: “New Officers Elected by Southside Society”, July 27, 1915. Miami News: “J.W. Warner, Leading Business Man, is Dead”, March 7, 1922. Miami Herald: “Teacher’s Services Tuesday”, December 11, 1961. Miami Herald: “City’s First Florist Closes After 66 Years”, November 27, 1972, by Eleanor Hart. Miami News: “A page from the past in present-day Miami”, July 18, 1978 by Jack Roberts. Miami Herald: “Zoning Changes passed to Save Historic Homes”, March 18, 1982 by Brenda Eady. Miami News: “The rebirth of east Little Havana? Signs of progress and of poverty”, July 12, 1983 by Robert Joffee. Miami Herald: “Mansion Seeks New Suitors”, November 20, 1983 by Sandra Dibble. Miami Herald: “Ever Hear of the Warner Place”, February 26, 1984 by Jo Werne. Miami News: “Dilapidated Building given new life”, January 1, 1986 by Keith Donner. Cover: Miami Floral Company at Warner family home. Courtesy of Dolly MacIntyre & Dade Heritage Trust. Figure 1: Ad for J.W. 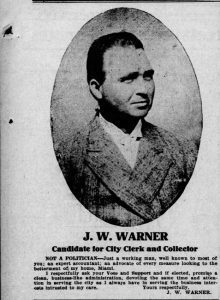 Warner for City Clerk in 1911 in the Miami News. Courtesy of Miami News. Figure 2: Warner family in front of recently completed home in 1912. Courtesy of Dolly MacIntyre. 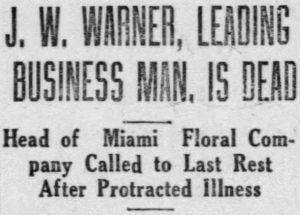 Figure 4: Obituary headline of James W. Warner on March 7, 1922 in the Miami News. Courtesy of the Miami News. Figure 5: Autumn, George and Elmina Warner stand outside of family home in 1978. Courtesy of HistoryMiami. Figure 6: Warner home in 1982 shortly after it was sold. Courtesy of HistoryMiami. Figure 7: Tim Blake stands outside of newly restored Warner Place in 1986. Courtesy of the Miami News. 1 Comment on "The Warner House"
My daughter attended the bakery school and I was always intrigued about the history of the house. There is a glass cabinet at the house full of pictures and momentos gathered from a box found in the attic Thanks for writing this article and filling in the gaps. Enjoyed it very much.